Nainital is a popular hill station in the Indian State of Uttarakhand and headquarter of Nainital district in the Kumaon foothills of the outer Himalayas. Situated at an altitude of 1,938 meters (6,358 ft.) above sea level, Nainital is set in a valley containing a pear-shaped lake, approximately two miles in circumference and surrounded by mountains. Some of the highest peaks of these mountains comprise one Naina peak (2,615 m / 8,579 ft) on the north, Deopatha (2,438 m / 7,999 ft) on the west and Ayarpatha (2,278 m / 7,474 ft) on the south. 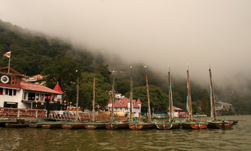 Nainital has temperate summers, maximum temperature 27°C and minimum temperature 3°C, during which its population increases more than fivefold, with an annual influx of tourists predominantly from the plains of Northern India. 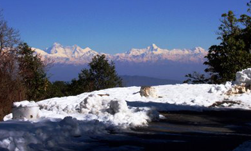 In the winter, Nainital receives snowfall between December to February with the temperatures varying between a maximum of 10 to 12 °C and a minimum of -1 to -3 °C. 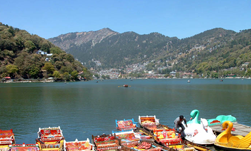 Naini Lake is situated in the heart of the city and it is owing to this lake that Nainital earned its name. 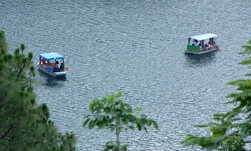 The eye-shaped lake is a tourist hotspot and acts as a magnet for all those visiting the hill resort. Here, a person can either take a leisurely stroll or indulge in boating and enjoy the surrounding beauty. 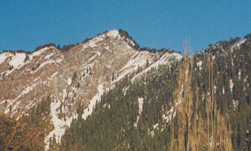 The northern end of the lake is called Mallital, while the southern one is called Tallital. The Lake Bridge that connects the two banks has quite a few shops as well as a post office, the only one in the world to be located on a bridge. 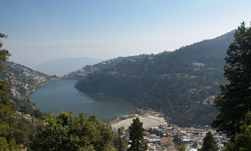 Nakuchiatal is a lake in Nainital, known for having nine corners. This lake is still untouched by majority of the tourist population and owing to this, has managed to maintain its serenity till date. Take a walk around the nine cornered lake to enjoy the beautiful natural setting. Otherwise, you can also go on a boating tour and explore the scenic surroundings. 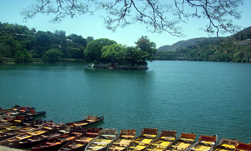 Situated 22 km from the city center, Bhimtal is the biggest lake of Nainital. It is named after one of the Pandav brothers Bhim. The lake boasts of an island within its precincts, which is home to a very famous temple. During the day, one can easily hear the chiming of temple bells, even from the embankment. 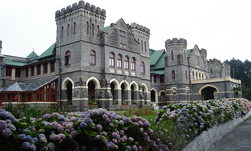 Built in 1899, Governor's House or Raj Bhavan is a marvelous reminiscent of the British era. Built in Victorian Gothic style, it served as the residence of the Governor of north-western province and later the United Province. Raj Bhavan is an architectural marvel and adding to its beauty are the well manicured lawns, a swimming pool and a golf course, situated within the premises. Presently, the structure serves as the guest house for the Governor of Uttarakhand. However, one has to take prior permission to visit the place. Built in 1844, 'St. 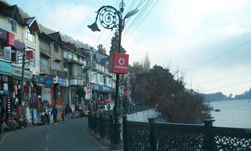 John in the Wilderness' is one of the most tranquil places in the town of Nainital. The church is located on Mallital, the north end of the town. The Bishop of Calcutta, Daniel Wilson was the one who laid the foundation of the church in Nainital. On one of side of lake-run The Mall road now named Pt. Govind Ballabh Pant Marg. It is lined up by many hotels, restaurants, travel agencies, shops, banks and other business concerns. In summer months of April, May & June the Mall road is closed for vehicular traffic in evening hours to facilitate Mall strolling which is the famous attraction for all the tourists. This road is the main link joining Mallital and Tallital. On the other side of the lake lies the Thandi Sarak (road). 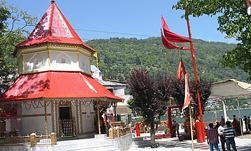 It is comparatively less busy and has Pashan Devi temple. Vehicles are not allowed on Thandi Sarak. At the northern side of the lake there is a place of rendezvous for people from all walks of life . Here evenings are heavily crowded. There is a statue of Pt. Govind Ballabh Pant and a beautiful fountain . There is a band stand . The Flats has playing ground used for sports games and cultural activities during festivals. There is Chat Bazar,Bhotia Market in the flats . In Bhotia Market vendors sell their fancy items .There is Mosque,Gurudwara and Naina Devi temple in flatts.Capitol cinema and Rink theatre which is used for roller skating are also situated in Flatts.A portion of the flatts is used for car parking .New club ,Boat House club ,Masonic Hall are in the periphery of the flatts for recreation. Around 1Km. away from bus stand at an altitude of 2100 m. located in sprawling open area is Pt. Govind Ballabh Pant high altitude zoo. 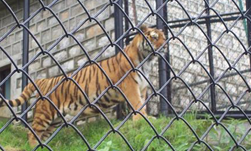 This high altitude zoo has Monkeys, Himalayan Black Bear, Leopards, Siberian Tigers, Palm Civet Cat, Wolf, Silver Pheasants, Rose ringed Parakeet, Hill Fox, Ghoral, Barking Deer, Sambhar. The Zoo remains closed for visitors on Monday, all National Holidays and festivals i.e. Holi & Diwali. 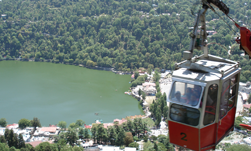 It is one of the main attractions of Nainital and this “Austria Make” Cable Car was first in Asia of its kind, made operational in May 16, 1985. Fully safe and in case of any emergency Cable Car (Trolleys) has fully controlled Hydraulic Brakes. This ropeway connects Snow-View Point (at 2270 m.) with Nainital near Flats. The aerial ropeway starts at Mallital and there are two trolleys to carry passengers. It takes approximate four minutes to cover one way journey by trolley. Cabin capacity is 10+1 or 825 kg.